Can Microsoft's new Lumia phones save Windows 10's mobile ambitions? When Microsoft devices chief Panos Panay announced the company’s new Lumia smartphones Tuesday morning, he showed a boundless enthusiasm for the forthcoming devices. He also had a message: Give Windows smartphones a chance. The folks in Redmond aren’t blind to the fact that the worldwide smartphone market is essentially a duopoly with Google and Apple running the show and more than 90 percent of all smartphones running those two companies’ operating systems. That’s why Panay pointed out the rapid adoption of Windows 10, which is running on more than 110 million devices just 10 weeks after the operating system was launched. This seems to be Microsoft’s gambit: build an operating system and drive massive consumer adoption, then leverage its market share on the tablet and desktop to attract developers who will also create experiences that (surprise!) work on a Windows-powered smartphone. Those universal apps for Windows 10 are key to the company’s ambitions, since they also make Microsoft’s new Continuum for phones feature (which lets phone users dock their device to a monitor, keyboard and mouse to use it like a computer) work well. 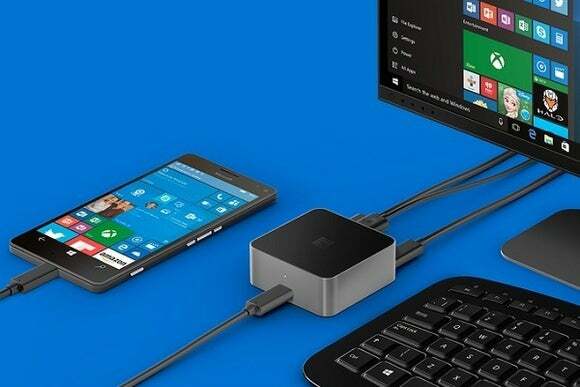 A docking station turns the Lumia 950 and 950 XL into lightweight desktops. On Tuesday morning, Panay showed off the Lumia 950 and 950 XL—two new smartphones built to take advantage of those features in Windows 10 Mobile and serve as Microsoft’s flagship phones for its smartphone platforms. 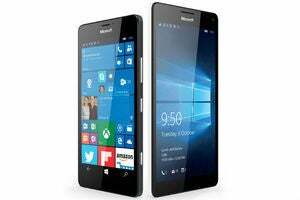 It’s good news for Windows on mobile devices, since Microsoft’s smartphone lineup has been lacking a standard-bearing phone for over a year. That’s all well and good, but Windows smartphones can’t succeed on Panay’s excitement alone. Microsoft still has to contend with the platform’s floundering app ecosystem. Earlier in the presentation, Corporate Vice President Terry Myerson happily told the crowd that Facebook had agreed to release a new universal version of its main app for Windows 10, along with refreshed versions of Messenger and Instagram. One of the potential benefits for Windows users of Microsoft’s patent deal with Google last week is that Windows Phone may finally get a Google-built YouTube app. Those are clear examples of how dire the app situation is on Windows smartphones. Right now the platform is lacking key apps like Snapchat, and those apps from popular companies that Windows Phone does have, like Twitter and Facebook, are usually woefully behind their iOS and Android counterparts when it comes to features. Microsoft's Lumia 950 and Lumia 950 XL. Still, Microsoft has managed to pull off a transformation like the one it needs in mobile before. The company’s Surface line went from a punchline to a billion-dollar business over the past three years, with its competitors racing to copy Microsoft’s design of a tablet with a detachable keyboard. The Surface Pro line kicked off a whole market of 2-in-1 portables which can be used as both tablets and laptops, and has proven massively popular. It always comes back to the apps, though, and that’s where the two markets diverge. One of the advantages the Surface Pro 3 has is that it’s able to run Windows desktop apps, which is a much broader set of programs than those just available through the Windows Store. Meanwhile, there’s another issue: Microsoft isn’t producing as broad a range of phones as Nokia used to. The company seems to be banking on third-party handset manufacturers to pick up some of the slack, which is a difficult proposition. After all, those are the same handset makers Microsoft implicitly snubbed when it bought Nokia’s devices and services business, and building Windows phones doesn’t seem like a great path toward massive sales. Ultimately, it remains to be seen just what Microsoft can do in a very competitive, crowded market.